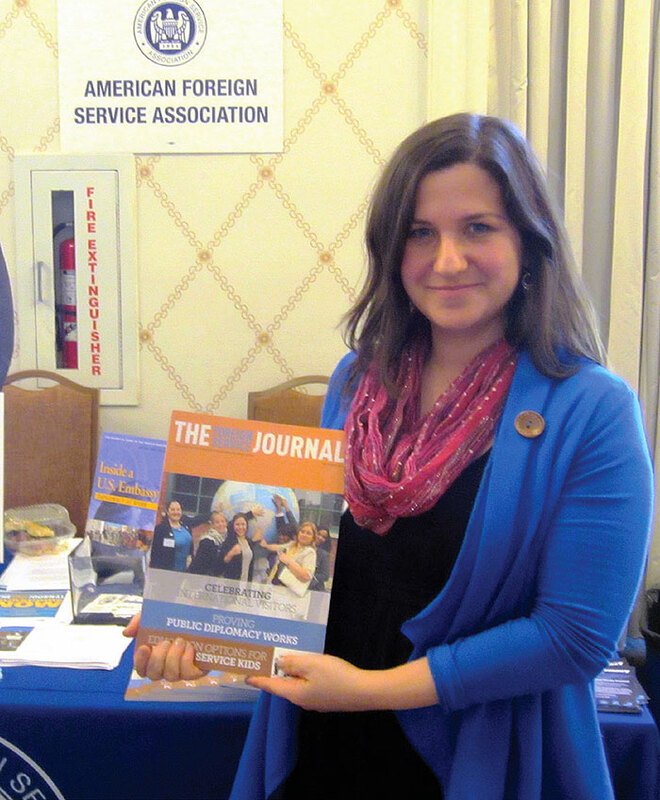 Embassy Moscow’s Assistant Cultural Affairs Officer Amy Steinmann at the Global Ties conference, holding a copy of the December issue of The Foreign Service Journal. In January, I attended the national Global Ties U.S. conference in Washington, D.C. My participation was made possible by the American Foreign Service Association, which raffled off a couple of conference registrations to public diplomacy-coned members. I am the assistant cultural affairs officer responsible for administration of the International Visitor Leadership Program for Mission Russia. My team and I run one of the largest IVLP portfolios in the world, with an annual budget of more than $1 million. In this capacity, I know all the processes involved in putting more than 130 Russians on planes annually and sending them to the United States, where they receive direct exposure to the workings of American democracy and develop a deeper understanding of our country. However, it wasn’t until I attended the Global Ties conference that I gained a true understanding of the many elements running stateside to make these programs happen. The conference brought together State Department officials, national program agencies (nonprofit organizations that implement IVLP) and hundreds of community based members—who help tailor program itineraries for our international visitors in places like Lawrence, Kansas, and Pensacola, Florida—to share ideas, exchange best practices and discuss the future direction of the department’s premier professional exchange program. Although the Jan. 22-23 “Snowzilla” nearly derailed my plans to attend the conference, I made it to Washington, D.C., from Moscow unscathed and was able to both share my perspective from post and gain insights during four days of strategic dialogue. The presence and participation of high-level State Department officials attested to the importance accorded by senior leadership to the IVLP and the fact that the program is viewed as a highly effective policy tool. Hearing from those who develop the program content, those who greet our visitors on the ground and those who interpret and serve as their guides was truly insightful and eye-opening. I learned of the challenges that inevitably arise when bringing groups of foreigners to the United States for an intensive, and at times, emotion-packed journey, and of the many successes which make this work so significant and rewarding. One of the greatest takeaways for me, personally, was the realization that IVLP truly does take a village—from government officials who align IVLP trips with mission strategic goals, to program implementers who design trips that meet those goals, to the families who open their homes to our visitors and truly showcase American hospitality. I’d like to thank AFSA for this opportunity, which allowed me to engage in in-depth professional development, to network and to make connections with hundreds of people devoted to this program. The conference was incredibly useful as I seek to enhance the value and benefit of IVLP exchanges, both to the participants and to Mission Russia. Amy Steinmann is a public diplomacy officer currently serving in Moscow. Her previous assignments have included Washington, D.C., Frankfurt and Georgetown. The views expressed in this article are those of the author and not necessarily those of the U.S. government.